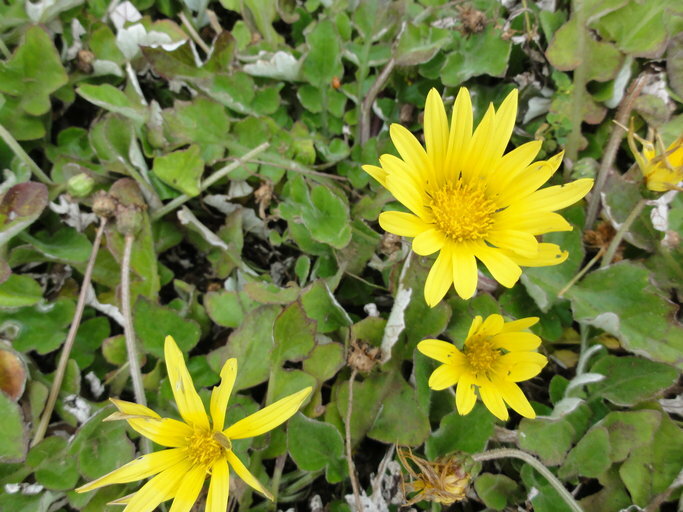 Arctotheca prostrata (sterile capeweed) is a rosette-forming plant (family Asteraceae) found in coastal prairies and as an urban escape in the San Francisco Bay area and California’s north, central and southern coast. The infertile type of capeweed is cultivated for use as an ornamental groundcover, and a fertile type has also been introduced. The infertile type is very competitive and can escape cultivation locally via creeping stolons, but fertile capeweed can spread faster, typically colonizing open or disturbed sites with exposed soil. Fertile capeweed is a major agricultural weed in Australia. New evidence suggests that the sterile and fertile forms are actually two separate species.